The announcement came at a meeting on November 28, 2017 between Prime Minister Rt Hon Theresa M. May and OT Leaders. 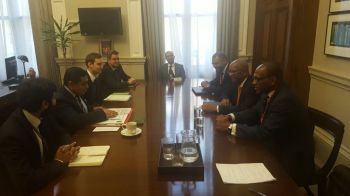 The Premier said, "I am pleased that the UK Government has responded to the BVI's request for a recovery and reconstruction package to support the Territory's recovery in the aftermath of hurricanes Irma and Maria." He went on to say, "UK loan guarantees and grants will not only help to accelerate our recovery, but also stimulate the economic growth and development that is needed to restore our economy," the Premier said. Premier Smith also held a working bilateral meeting with Overseas Territory Minister Lord Ahmad in which they discussed BVI's preparation of a long-term recovery plan. Recently Premier Smith announced that the Government has developed proposals for the VI's recovery and will be seeking to finalise those plans after consultation with the public. Premier Smith further concluded "I am pleased that the hardworking and resilient people of the BVI continues to steadfastly rebuild our Territory. UKs financial support will help to ensure that further financing is available to support our efforts and the significant action needed for BVI's recovery. I [am] looking forward to working together with the people of the BVI; along with all our partners to ensure that we rebuild BVI Better, Stronger, Greener in a sustainable and resilient manner." Premier Smith is currently leading a VI delegation at the annual Joint Ministerial Council in London between UK Ministers and OT Leaders. He is joined by Minister for Communications and Works Honourable Mark H. Vanterpool (R4), Chair of the Disaster Recovery Coordinating Committee Brodrick Penn, Financial Secretary Glenroy A. Forbes, Director of International Business Regulation Neil M. Smith, Director of the BVI London Office E. Benito Wheatley, Deputy Director of the BVI London Office, International Relations Intern Akita Alexander and International Relations Intern Xyrah Wheatley. More talk when we going get the money? I hope the first thing they do is fix these death traps called roads. Even if the hurricanes didn’t damage your car, the sink holes did and still doing so. Not only that, you can get killed when someone loses control after falling in. PLEASE fix the roads first!!!! The people of the territory wants accountability and value for money. Nobody is celebrating until the end result comes and the money does what it suppose to do and the Governor does what he suppose to do according to the constitution and make sure this money is accounted for and well spent. The people thank the Uk Government and hope at the end of this money trail will be a light of prosperity for the people. I hope the UK GB government puts someone to monitor how this money is spent cuz we are doom if its lefted solely up to them. So now all of them happy to sit at round table in the UK house. Strange how Jaspert was not allowed to be sworn in, in their so-called House........ God really knows how to humble people and make them look stupid!! At £1=$1.34, the UK is giving the VI £10M or $13M in grants. And in loans, it is guaranteeing up to £300M or $402M. The UK is not making the loans; it is only guaranteeing the loan, meaning that if the VI defaults on the loan, the UK will cover the loan. The VI has to negotiate with financial institution(s) to acquire the loan(s). Consequently, since the UK is guaranteeing the loan, it will establish terms and conditions for acquiring the loans. Moreover, the current working recovery estimate is $3.6B. But the loan is only about $402M; this leave a delta of approx $3,198,000,000.00 still needed. A power a money is still needed. How much of the $2B pledge by various countries and agencies at the CARICOM-UN high level pledging conference for countries that were affected by hurricanes will the VI get? The Netherlands pledged $702M but probably most of that will go towards St. Martin and other overseas territories. How long will the loans be for, ie, 10, 20, or 25 years? And what will be the opportunity cost, ie, what will not get done or need to be deferred? Undoubtedly, the VI and other countries must be grateful for the pledges towards their recovery effort incident to Hurricanes Harvey and Maria. Nonetheless, the region still needs a Marshall Plan similar to the Marshall Plan that bailed out Western Europe after WW II. Furthermore, some loan forgiveness may be needed. Of course, as part of any deal, recipient countries will have to agree to some structural adjustments and terms and conditions. Yes, we need the aid. Thank you very much. But please, don't give the money to NDP Government to manage. They are just going to piss it away.